This week we invited regular visitor and illustrator Beth McManus to discuss her experiences of attending Manchester Art Gallery’s workshops and wellbeing sessions. She cleverly depicts these events through her affectionate and playful illustrations, which effectively place the viewer in her shoes, bordered with charming personal anecdotes…. I started using illustration back in February 2018 when I was procrastinating my way through the final hours of an immensely stressful MSc dissertation deadline. I was asked to create a personal and professional timeline with the only instruction that it had to fit on a piece of A1 card, and I decided to make illustrated bunting to document key people and events in my life. As my work with illustration has evolved into more of a visual autobiography, I use my thoughts, reflections and observations alongside the image as a means of communication and storytelling. The written element is restricted by the length of the outline and for me it’s a fairly automatic process. I try not to think too much about what I’m going to write before I begin and I revise the words or sentiments I want to include as I write, making sure that my thoughts fit within this self-imposed boundary. I like the playfulness of writing my thoughts in this way - in order to read the text, you have to turn the drawing in your hands. I create my work digitally and post it online and I like to think that this method encourages interaction and a quiet moment of lingering to disrupt a world of infinite scrolling. 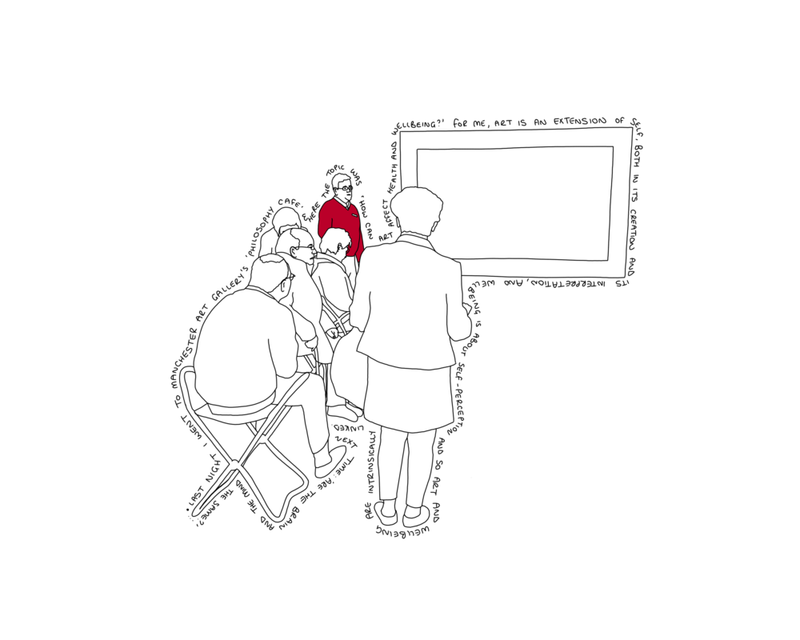 My first facilitated experience at Manchester Art Gallery was ‘The Art of Wellbeing’ Tour back in February 2018, led by the effortless John Ward. I have always loved the almost oppressive solitude of an afternoon spent wandering around the gallery, it’s ancient and contemporary works nestled side by side. I have been fascinated by the striking disparity between those pieces that were capable of conjuring great emotional responses stirring deep within whilst others only inspired the blank stare of total apathy. Taking a tour focused on wellbeing seemed like an accessible first foray into guided visits for me and it piqued my professional interest as a psychologist interested in wellbeing and creativity. I found that looking, really looking at the works John had selected whilst he brought them to life through their history and the context of the artist and the time in which they had been created had enabled me to view the works without the weight of judgment I think we all feel necessary when appraising art, even when we fail to understand it’s message. This contradiction of feeling at once safely distanced and simultaneously submerged in each piece was mirrored in a mindfulness exercise led by Chris Jeffries during a more recent visit where I found myself quietly participating in the gallery’s ‘Philosophy Cafe’ on a nondescript Wednesday evening. We explored the question ‘How Can Art Affect Health and Wellbeing?’ through a series of gentle discussions and a mindfulness exercise. The conversation that followed about the piece around which we were gathered, ‘Mount Bay Early Morning in the Summer’ by Henry Moore, left me recalling vividly the smell and energy of the ocean from a childhood holiday. Powerful stuff. The evening culminated in a group discussion led by Ruth Edson where the format only slightly stilted the conversation. The agreed process of hand raising and listing names, each speaker taking their turn patiently, led to the conversation meandering slightly between points. Perhaps had the group not been so large, a slightly sprawling 21, the discussion would have provided more discussion and debate rather than the sometimes isolated points made into the space between us. I left wondering if perhaps dividing the group into two might have provided more safety for those who sat in silent contemplation, however this creates its own problem of sharing the learning and insight with all who had gathered. I have to confess, the most intriguing conversation I had was centred around one of the attendee’s early admissions that he had kept a daily diary since 1971. I had so many questions which fizzed in my mind and even bubbled over into the next day - how many volumes did this tome occupy? Had he always used the same style and size of notebook? The same coloured ink? Were the finished books stored safely in a box or displayed on a shelf? Had he shared them with anyone? Would he consider publishing excerpts? Did they include mementos or illustrations? Perhaps this revelation resonated with me more because of the way I have started documenting my daily life through illustration but I chose not to explore the topic in depth as it felt at once personal and too far a deviation from the prepared topic. It did, however, allow me to crystallise what it is about these events at the gallery that really resonates with me. Even with the fascination of people watching aside, the true magic in these events is how the people who assemble are willing to share their time and often intimate thoughts and feelings without agenda or expectation.